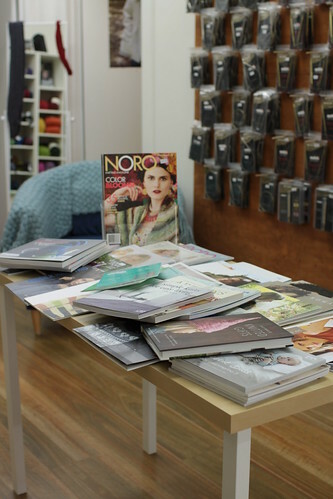 Last week we visited Woolarium, a new yarn store in Northcote and had a chat with owner Sharron Kellock. 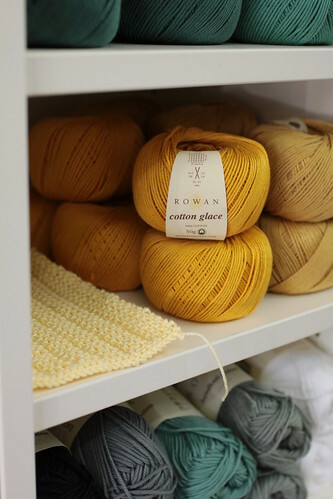 Woolarium is a new yarn store in Northcote. 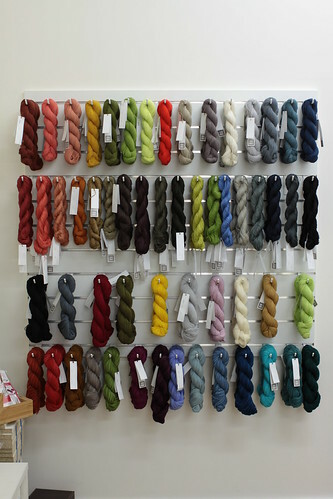 At Woolarium you can find many yarns of different fibre, colour and texture. 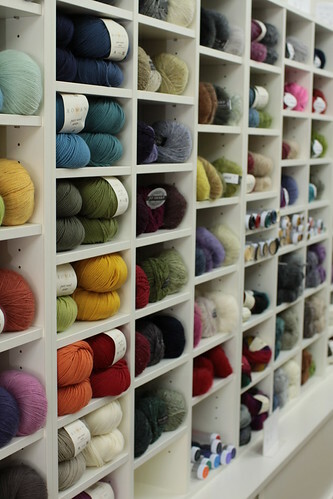 In fact we have 12 metres of shelves, almost 50 different types of yarn and over 700 colours. We stock Rowan, Debbie Bliss, Millamia, Ella Rae, Noro, Sublime, Zara, Jo Sharp, Misti Alpaca and Shibui. With a few more brands coming soon. We also stock a good range of buttons, Addi, Clover and Knit Pro needles and our pattern collection is growing with pattern books and single pattern leaflets from the major brands. We also have some ‘how to’ books and we can provide links to some of the many free patterns available on line. 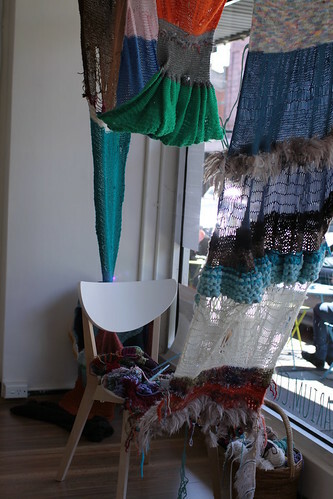 There is also space for the weekly sit and knits and later classes. 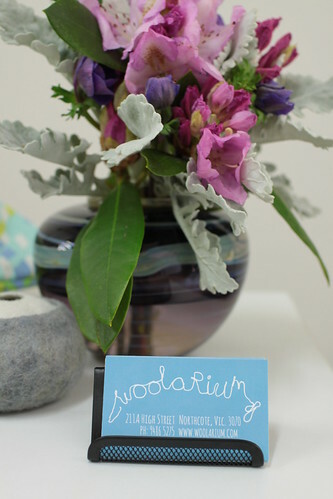 You can come down to the shop at 211A High Street Northcote, or find our on line store www.woolarium.com. You can also find us on Facebook, Instagram and Ravelry. I am more than happy to help anyone with a particular problem, learn a stitch or technique, read a confusing pattern or help substitute a yarn. Which is your own favourite yarny creation and why? Hmmmm......... I have a big interest in sculptural knitting and like to play around with 3d forms, knitted and other textile related elements. Several pieces spring to mind, one by Arline Fisch - jelly fish like knitted forms using copper wire, Debbie New’s ‘Coracle’ - a boat, lace hand knit in merino and cotton, sealed with fibre glass or Adrienne Sloanes Fated Glory installation - linen knitted red, white and blue body shapes arranged to form the American Flag. There have been many over the years............Kate Gilbert, Veronik Avery, Norah Gaughan, Kim Hargreaves to name a few. 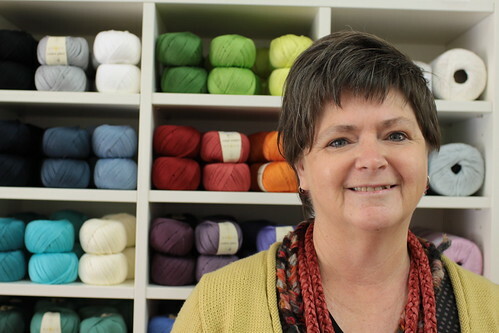 More recently I have admired Kirsten Johnstone and Lori Versaci designs for Shibui Knits. What is your 'must have' tool? 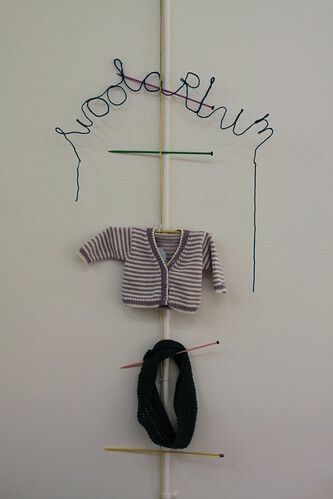 Its tempting to say knitting needles but ........... I do like Addi circular needles depending on the garment. I like bamboo too. Its hard to know if I have a must have tool, if I’ve got some inspiring yarn and some needles and the time to create I’m happy. Two tools I’ve used a lot lately is a pom pom maker, theres so many things to do with pom poms. And the other is my Swift and Ball Winder, turning all those hanks into manageable skeins. The other place that is special for me is sitting on the deck down the beach, with the sound of the waves and the dappled light through the trees. What are your top 3 tips for the beginner knitter? 1. Knit something that you really love, even if you think its too hard, you’ll learn whatever techniques you need if you love it enough. 3. Yarn is very forgiving, you can make it do whatever you want. There are no such things as mistakes, its just another creative opportunity. Colour and texture are my thing. I wanted to be able to share that with people. I love it when people come into the shop and I hear “oooo” or little giggles of delight or ‘look at that colour’ and they just have to touch it! The best is the look of absolute joy and pride on someone's face when they've made something they love. There’s nothing like the joy of creating something with your own hands. The more contemporary knit wear designs these days are full of style and the yarns are soft and a delight to work with, I wanted the shop to reflect that growing trend.